Parents – your experience matters! If you are a parent in Oregon City with one or more children in grades 5 and up, we want to hear from you! You may have already received an invitation to this year’s survey in an email from the School District. If you haven’t seen it yet, you can follow this link to help us gather this crucial information. OCT’s annual Parent Survey is due May 20. Thank you for helping us to keep Oregon City’s kids healthy & safe! Save the date: April 9, 2015 for the “Teens & Marijuana: Changing Landscape Ahead” Community Forum. Parents and Mentors of young people, come learn about what is happening with youth in Oregon City. 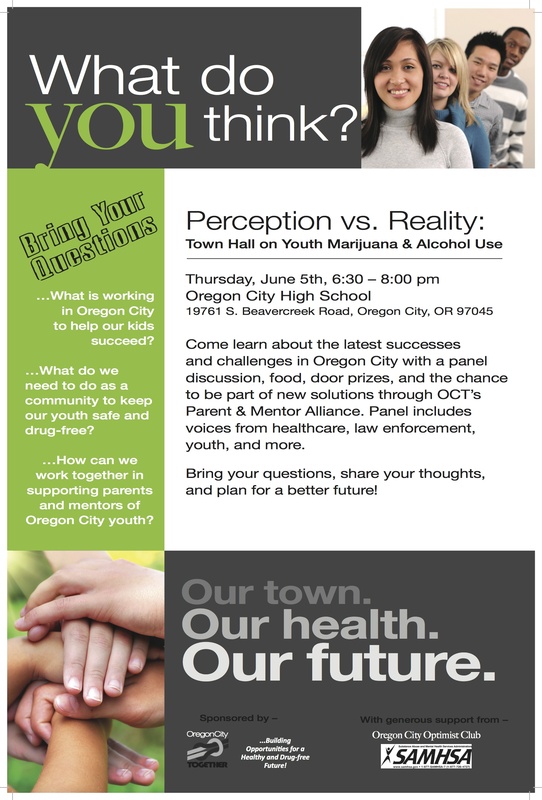 OCT is hosting a panel and Q & A session to help us re-think our assumptions about Oregon City’s youth marijuana and alcohol use. Bring your questions, share your thoughts, and plan a better future!